The Roy Choi Express pulled up to its third and final stop at Sunny Spot just as soon I returned home from my extended break back east. 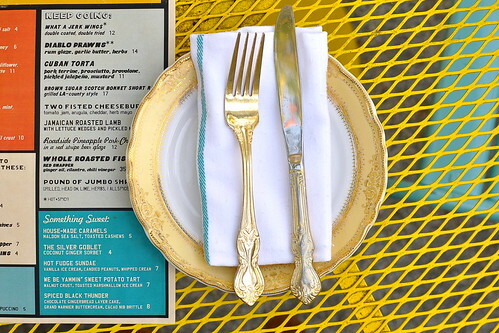 The food at this “roadside cookshop” is Caribbean-inspired, while the mood is rum-soaked and laid back. 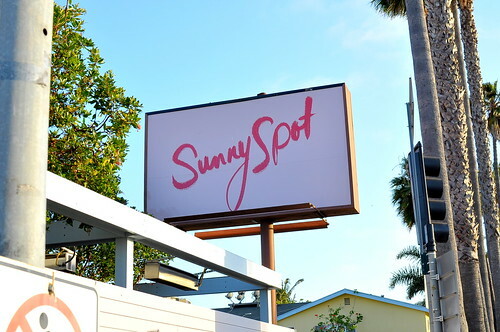 Every day’s a holiday when you’re kickin’ it at Sunny Spot. Diep and I grabbed a table on the patio on this warm spring evening. The fancy plates and silverware had my date downright giddy. She thought it was the perfect accent for the unfussy food coming our way. 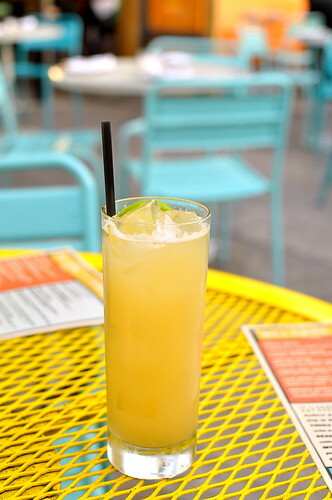 To start, Diep sipped a rummy cocktail recommended by our waiter, while I selected the fizzy and spicy house made ginger beer ($4). After getting our drinks properly in order, we then proceeded to order a week’s worth of food. It’s kind of amazing eating with Diep because she’s always game for anything. If I mention that a dish sounds remotely interesting, her response is usually an enthusiastic, “Let’s get it!” We always end up with too much to eat as a result, but no one seems to mind. It just means late-night treats for The Astronomer and Alice or awesome lunches for us the next day. Food landed on the table in no particular order as soon as the kitchen finished plating it. 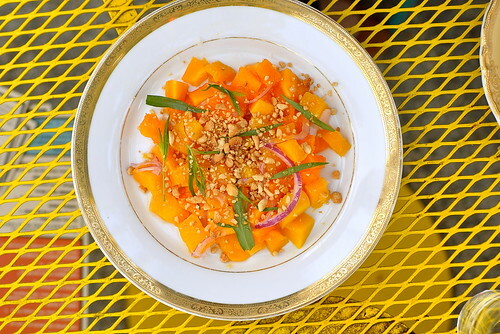 The first dish to hit the scene was the Papaya Mango Salad ($6) dressed in lime and honey and topped with crushed cashews, red onion, and tarragon. The fruit salad tasted good by itself and even better paired with the spicier proteins that came out later. The tarragon was sparse but effective. 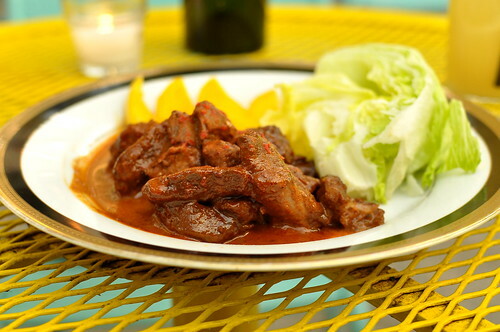 My favorite savory dish at Sunny Spot was the Jamaican Roasted Lamb ($18) with lettuce wedges and pickled mango. This was intended to be a DIY lettuce wrap, but I zoomed in on the tender meat, killer sauce, and pickled mangoes and never looked back. 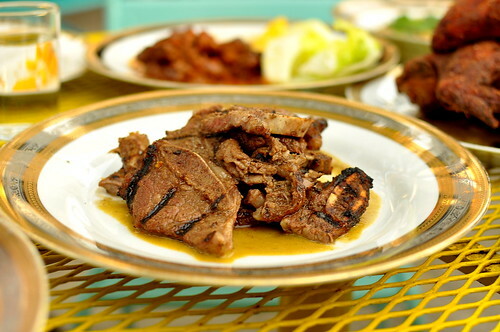 The Brown Sugar Scotch Bonnet Short Ribs ($17) grilled “LA-county style” singed our lips with their deceptively mellow yellow sauce. Korean barbecue with a spicy Caribbean twist. 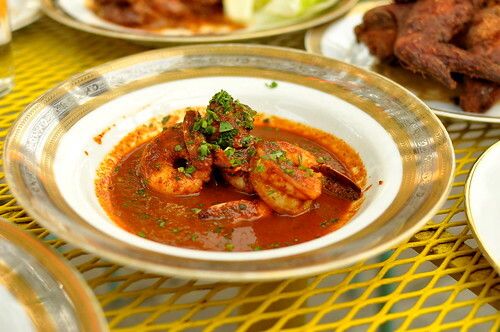 The Diablo Prawns ($14) offered an unexpected reprieve from the tongue-scorching ribs. Bathed in a mix of rum, garlic, butter, and herbs, the shrimp were snappy and saucy. The level of heat on the “What a Jerk Wings” ($12) was as challenging as the short ribs. 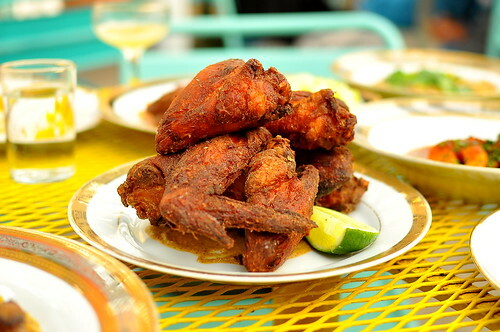 Double coated, double fried, and resting in a pool of spice, the super-sized wings had me clutching tightly to my ginger beer. 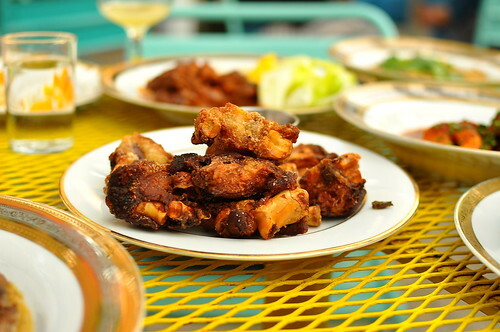 A meal at Sunny Spot isn’t complete without a plate of Sugar Cane Fried Pigs Feet ($6). Sprinkled with coarse salt and served with a chili vinegar sauce, the gelatinous and chewy bits were jammin’ in my mouth. 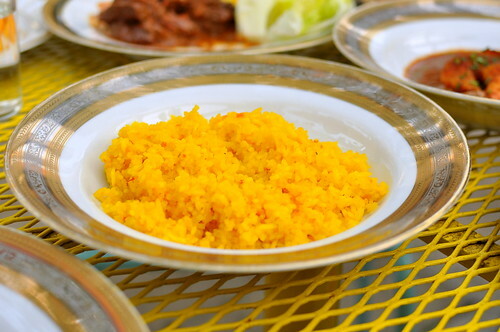 The Yellow Salty Rice ($4) was just the thing to sop up all of the wonderful sauces served this evening. I especially loved it with the roasted lamb. Rounding out our spread was a serving of the Muh-F*K*N Mofongo ($6), a chunky mixture of overripe plantains, bacon, garlic, and black pepper. A bit sweet, kind of smokey, and very savory, this Mofongo was a mother effing treat. We waited until the sun had set and our friend Nastassia had arrived before commencing dessert. Beth Kellerhals, the queen of sweets at all of Roy Choi’s restaurants, makes some of the most memorable and delicious desserts in town. Here at Sunny Spot, her suite of sweets is better than ever. 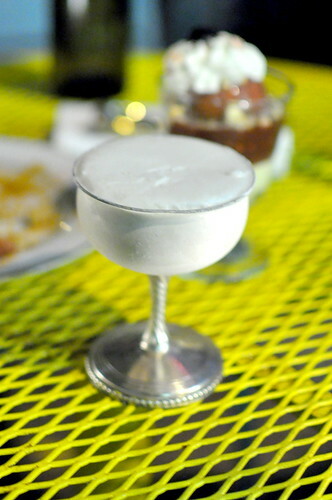 The coconut ginger sorbet ($4), which was served in an ornate silver goblet, was Diep’s favorite in presentation and taste. 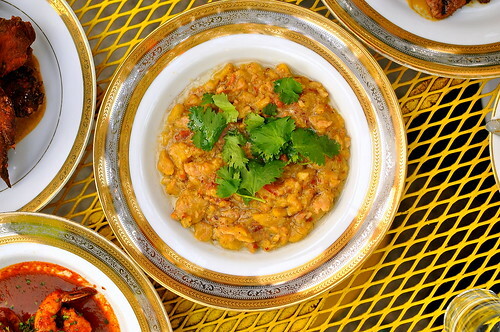 The flavor reminded us of che troi nuoc, a sticky and gingery Vietnamese dessert filled with mung beans. 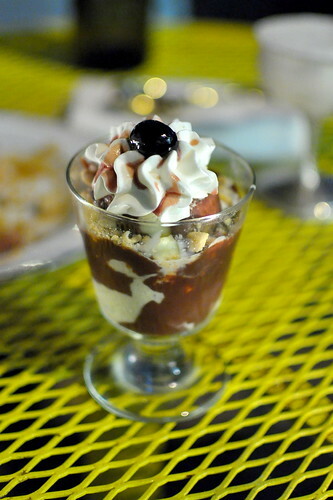 Roy Choi is a self-proclaimed hot fudge sundae fiend, so it was no surprise that one turned up at Sunny Spot. The version served here was sized just right ($7) with a big scoop of vanilla ice cream, candied peanuts, whipped cream, and a whole lotta hot fudge. 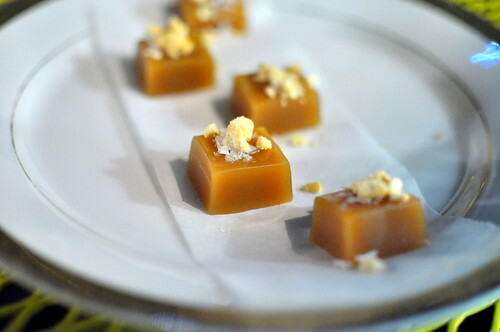 The house-made caramels ($5), which were sprinkled with Maldon sea salt and toasted cashews, melted in my mouth with a buttery sweet finish. 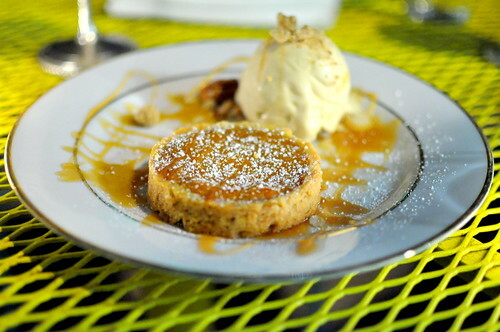 Best of all was the “We Be Yammin” ($7), a sweet potato tart with a delicate walnut crust and unbeatable marshmallow ice cream. Way to go transforming a classic American Thanksgiving side dish into an irresistible dessert, Beth! High-five! 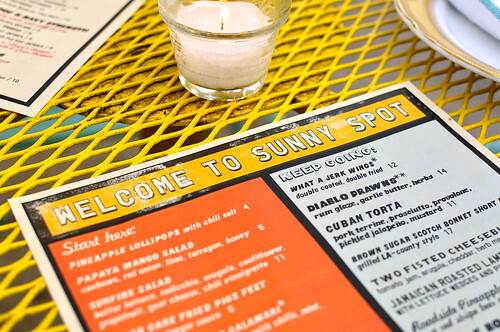 Even though Sunny Spot was the last official stop on the Roy Choi Express (See: Chego, A-Frame), the fun surely won’t end here. With new recipes to try on Chef’s blog and exciting projects in the works in Koreatown and possibly Highland Park, the Roy Choi Express will keep thundering on. Choo choo, forever. I hope. That LAMB looks delicious!!!! and the YAM too! haha I like things that rhyme. My mouth is literally watering at everything you had. I hope I can get to check it out when I’m in LA next month. I am ready for the HEAT and Roy Choi’s sexiness. This is one of my favorite posts in 2012! Going tonight with my brother. Can’t wait (to try the full dinner)! Beautiful photos. SUGAR CANE PIG’S FEET!